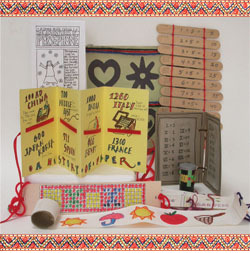 Take a cultural journey around the world with sixteen bookmaking projects that work across the curriculum. This book makes it easy with accessible materials, hints for preparation, clear directions, and historical information. Learn about the development of the alphabet from Egyptian hieroglyphics with this simple scroll that uses pictures to write out a name. Make a necklace or pendant with graph paper and learn about the symbolic language of beads in South Africa. Recycle a film container to make a wish scroll based on talismans made in Ethiopia for personal protection and cures. Create a construction paper cloth for a historical person or book character based on adinkra cloths from Ghana. Dakota Indians counted the years by winters and marked each winter with an image drawn on a buffalo skin. Use a brown grocery bag to make your own. Make an accordion book with a ribbon threaded through to act as a time line and learn about the books made by the Aztecs and Mayans. Write and illustrate a comic book in this simple eight page book made from one piece of paper. This project is inspired by accordion books made by Otomi Indian healers in Mexico. Illustrate your book with cut-outs made from pieces of brown bags. In India, Indonesia, and Southeast Asia, traditional books are made from palm leaves. Make your own palm leaf book from stiff paper. Learn multiplication facts by making a slat book which was the first book form made in ancient China. Celebrate the seasons with this four page accordion book with a ribbon tie. Sew a book with a side-stitched Asian binding and fill it with haiku and simple cut paper illustrations. The Vikings erected rune stones as memorials to the dead or announcements of the accomplishments of the living. Use the rune alphabet provided to make a stone for a family member, friend, historical figure, or fictional character. Romans wrote notes in wooden books with wax covered pages. Make your own version with card stock and wax paper. Write about a specific event in history or current events in a book modeled after the Newsbooks of Europe which were the forerunners of newspapers. Make a Medieval Book of Hours or Word Book with decorated foil covers and illuminated initials.